Let's save our environment by not wasting our limited resources and hard earn money. You can save up to 20% of fuel cost and trouble free longer lasting engine life. Find your own sweet spot for your car. Ozbush Electronics is relocated to beautiful Glen Innes NSW 2370. Office, Service and Factory is now all at the same place. We are still trying to normalise the daily work but still things are slow especially internet. Thanks to our friends/customers who came to help us. Very much appreciated. Please leave us text messages when you can't talk to us. The Satelite system is not yet came. *** Toyota Land Cruiser L200 V8 Engine Manual Mapper (OBM-191) is nearing the release after 9 months of trial! We are now accepting Pre-order. 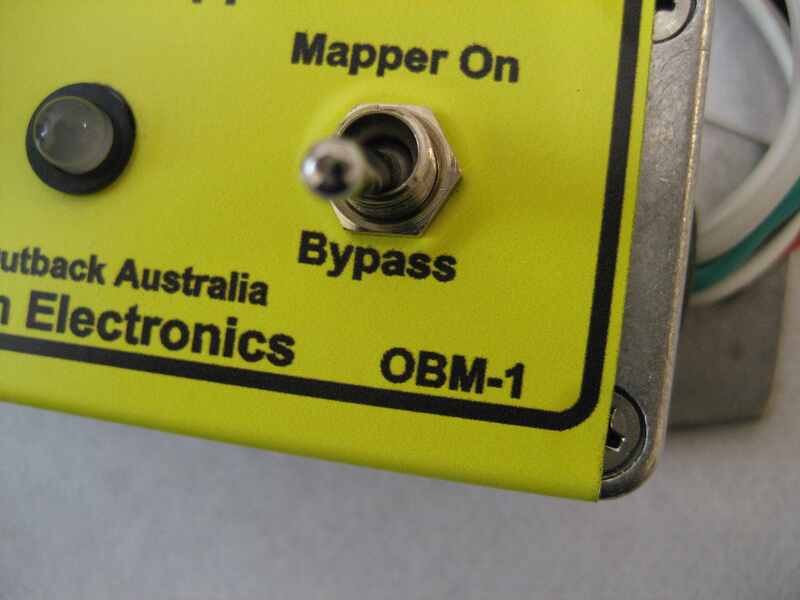 *** Pre-production version of OBM-191 is available at $295 plus delivery. Please contact us through email for details. New model Manual Mapper model OBM-121 and 126 is now on sale! Please see second page Products and Purchase Info. OBM-2 for Toyota Hilux and Prado 120 with 3.0 Litre 1KD-FTV diesel engines (Up to 2015). OBM-101 for Toyota Prado 150 with Digital MAF sensor 1KD-FTV Engines. OBM-2P for Toyota Landcruiser Prado 90 Series 5VZ-FE Petrol Engines. OBM-2T for Toyota Hilux, Prado 90 and 120 1KZ-TE Diesel engines as a Turbo Controller. We have supplied many units to 4 wheel drive community!! Mainly in Toyota Prado and Hilux, Mazda BT-50 and Ford PJ/PK Ranger. What does our Manual Mapper do? 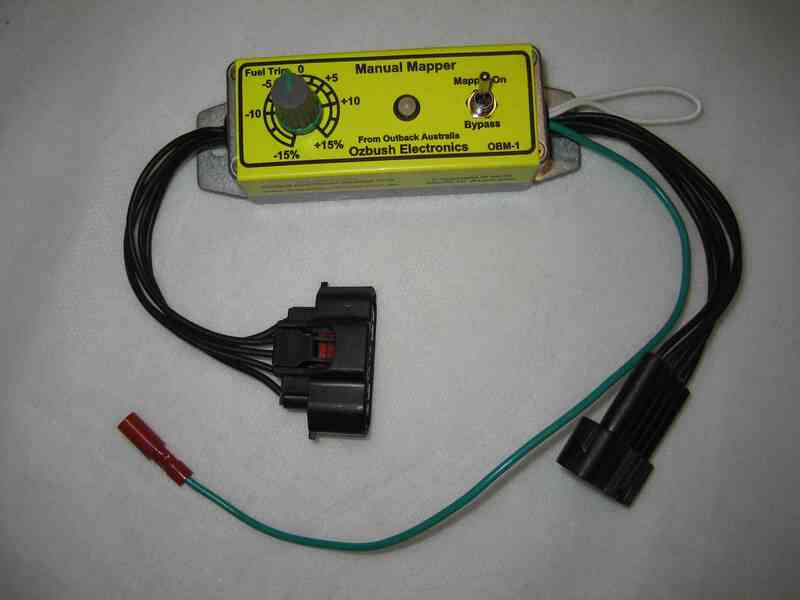 Our Manual Mapper is Primarily a Diesel Fuel Delivery Control Device to run your diesel engine more economical or put extra power by dialing the knob. In addition, you have an option to stop your car EGR system, which causes reduction of the power and economy and early retirement of your engine. You can operate your car with EGR disabled in private land use, off-road or racing. Manual Mapper does this by using Bypass switch. You can turn on the Manual Mapper when you are in private land, off-roading or racing with EGR disabled, then you can put switch to bypass to turn off EGR disable option when you are in public road. You may heard many stories about what happens if you block or disable the EGR system. There are literally hundreds of stories about do's and don'ts around blocking or disabling EGR system. And the most of the trouble stories are true. 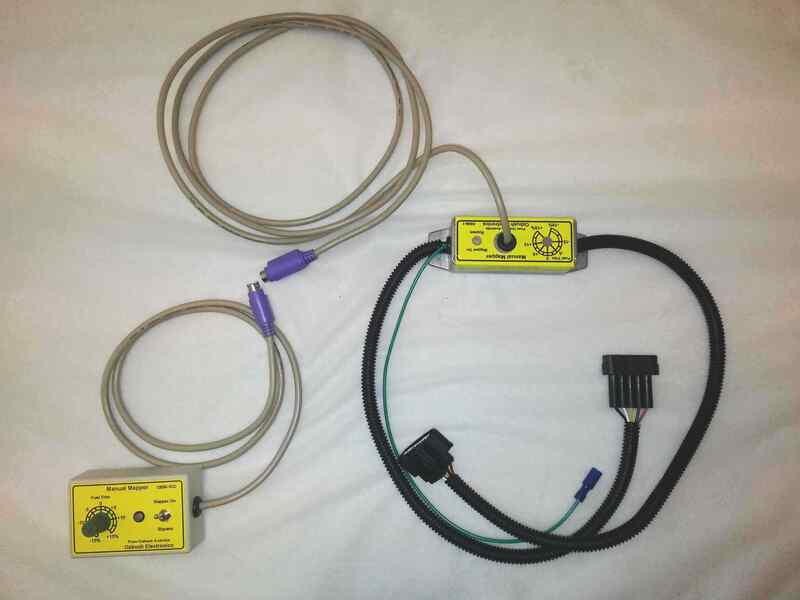 However, Our Manual Mapper electronically simulates EGR condition precisely to the car computer demands and car computer does not know that you have blocked EGR system. Therefore, the car computer will not turn on error codes or fault light on the dashboard. None of systems are affected by our device. Note: We highly recommend to physically block your EGR pipe with a full blanking plate to stop Exhaust gas (Blue Flame) burning out EGR gas cooler and leaking the engine coolant. It is a ticking time bomb. It happened to too many people and end up damaged cylinder head. In early devlopment, we have tried only electronically closed EGR valve without the blanking plate, but it still burnt out the EGR gas cooler, because the blue flame still come up to the EGR gas cooler despite EGR valve is closed. This is the reason why we strongly recommend to fit full blanking plate to stop the blue flame. It is the best way to block off the EGR system without any adverse effect. 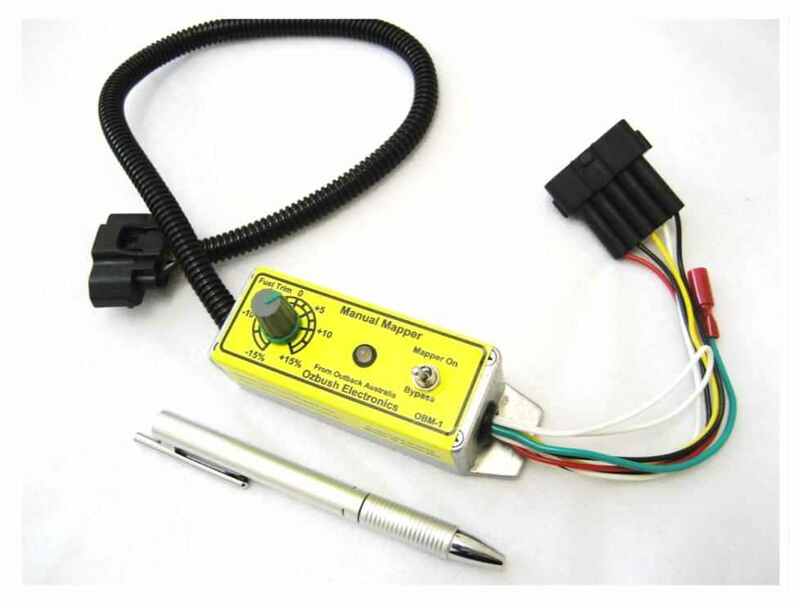 Please note that we DO NOT use a harmful temperature cheating method to stop EGR system that is using a 9 cents resistor to cheat intake temperature is below 10 degree so the car computer is turning off the EGR system. It works for many brand of cars except Toyota. Please read the mode 1 operation. Note: Turning off the EGR emission control system in public road is illegal. It is a device very easy to install, just plug and play and only takes about 10 minutes to install. No cutting or joining wires are necessary. It installs near air cleaner box in the engine bay where MAF (Mass Air Flow) sensor is located. We also have an in cabin control version manual mapper by the popular demands to set the fuel trim dial without opening the bonnet. Designed and manufactured in accordance with military specification by highly experienced engineer in this field and who are also a 4 wheel drive outdoor enthusiast. Fully tested with IP67 specification. Its aluminium die-cast body with epoxy resin seal inside makes this device fully waterproofed. Extensively tested with all terrains and climates in Australian outback. Fully immuned against corrugated road and desert heat. Designed and Tested to withstand from -25C to +85C temperature. 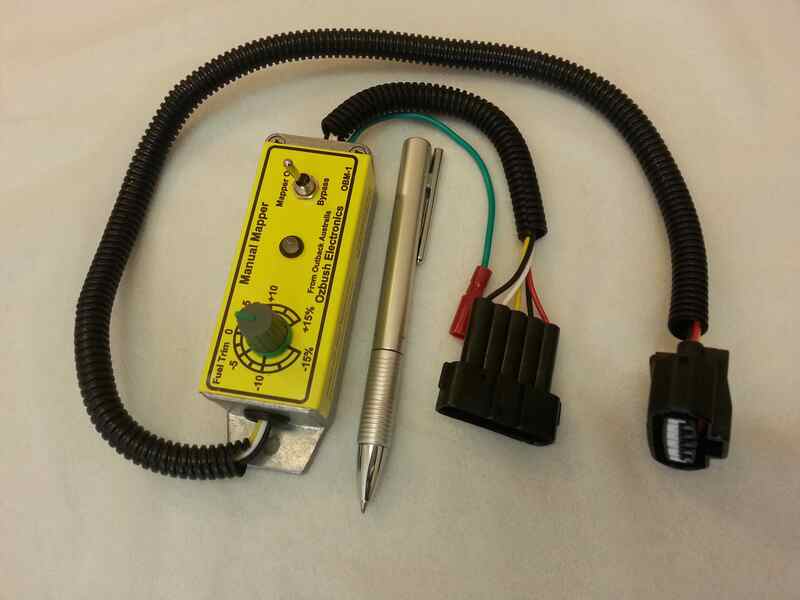 Can also be used to control petrol engines. 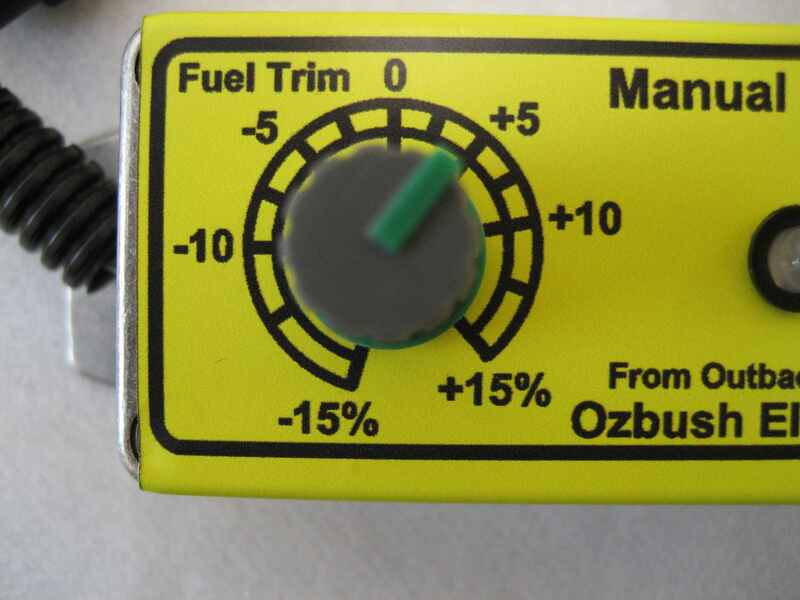 Ozbush Electronics Manual Mapper the Diesel Engine Fuel Trimming Device. Make your engine more flexible. Do you think your engine is out of tuning? Despite modern engine’s wonderfully sophisticated engine management computer system with arrays of sensors to control your engine to peak efficiency, but very often I hear from people that they are using too much fuel or lacking the power. There are many ways to boost your engine power by installing many gadgets on the market, but very often you will find your engine is already tuned for maximum and extracting more power will risk premature engine failure or shortening the engine life. Car computer is designed to treat all the engine mechanicals same, but we often find it isn’t. You will find every engine has its own character and need to fine tune it, especially the fuel consumption and power. It is okay for many people to just use the car with factory designed spec, but many will find old days of tuning your own engine has gone due to globalisation and computer control of the engine. 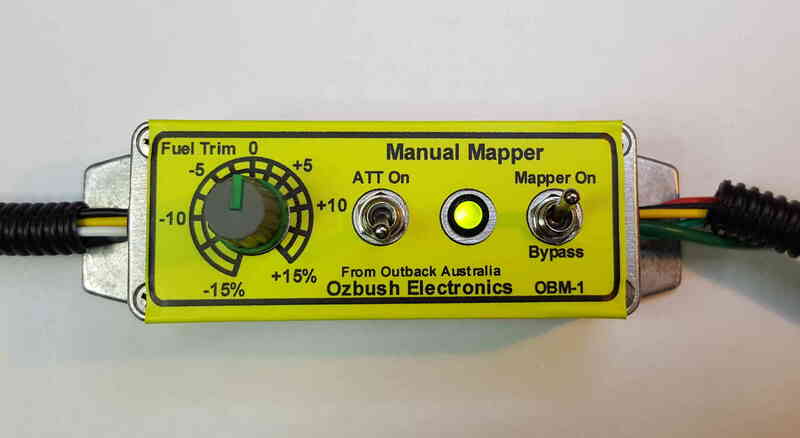 Ozbush Electronics Manual Mapper brings back some of those lost flexibility. Here is an opportunity to have some control of your engine. We have been releasing Manual Mapper all over the world since 2015 with incredible support. Our device looks straight out of the bush, but it works without fancy packaging for an affordable price to you. Our device does not give you the massive power increase, but it merely does fuel trimming for more or less of fuel delivery control within the limit of your engine tolerance so that you can fine tune your car. You can set for more fuel when you have a full load, then you can set it for less fuel when you have an empty car by simply setting the dial. Very often a user will find best sweet spot settings for their car. Our ATT (Auto Turbo-boost Trim) function will give you the extra turbo boost for acceleration even you are set for the economy. Our device does not temper with fuel system at all, we are merely asking car computer a permission to reduce or increase fuel by modifying air flow information which is a very safe way to have your input. And it is so simple to install and very reliable. Even if you have trouble you can easily revert back to original system by flipping the switch to bypass or unplug the device in few seconds. For the private land users, off-road or racing people, our device has an option to suspend the EGR system for better breathing and more power without the trouble code. You can reclaim the lost power and engine longevity. Our EGR suspend function is a state of art by fully simulating the EGR system so the car computer doesn’t know that you have suspended EGR system. We do not use intake air temperature cheating to turn off EGR system which can be harmful to your engine. We currently have the Manual Mapper for Toyota, Mazda, Ford and Nissan diesel engines and more products will be introduced for other models. Our Manual Mapper has built in state of the art latest microcontroller chips with a very sophisticated control software to work with car computer systems. Our device will work together with your car computer without forcing anything. Designed by retired car computer design engineer who has more than 30 years of outback 4 wheel driving experience and manufactured by retired electronics assembly people who lost their jobs by cheap imports. The Manual Mapper has been designed to give more flexibility to the car user by trimming the air flow information to the car computer. Unlike many other power chip devices in the market, our manual mapper does not force more fuel into the cylinder without consent of the car computer. We believe the most of diesel engines in the market has already been tuned to maximum power from factory and any more power extracting will seriously jeopardise the engine life. Our manual mapper will simply ask car computer a permission by giving less or more air flow information. The car computer will accept total plus or minus 20% of error on mass air flow sensor input. For example, 1 PSI, which is one atmospheric pressure is turbo charged to 22 PSI then the car computer will try to maintain this 1:22 ratio most of time and it will accept 20% of the difference before error code is generated. To maintain constant turbo pressure, there is a controlling mechanism to adjust the turbo compression rate by turning vane disc to the turbine (it's called variable geometry). This mechanism is usually a vacuum operated lever or stepper motor to turn the vane disc. Therefore, if manual mapper reduces the air flow rate by say -10%, then the car computer will adjust the turbo pressure and also reducing the fuel injection accordingly. Likewise, if the manual mapper set dial to +10%, then the car computer will also adjust the turbo pressure and inject more fuel too. But this not the same as you are pushing the pedal to adjust speed or power. If you set the mapper dial to -15%, then you will find pedal response is very dull and you will struggle to climb on uphill. On the other hands, if you set the mapper dial to +10%, then uphill climbing response is very easier than without Manual Mapper installed. With this knowledge, manual mapper has trimmed range of -15% to +15%, which is a very conservative figure without pushing to the extreme end. Any more difference than 20%, the car computer will reject and generate error code with a check engine light on the dashboard. In many old car engines, the variable geometry vane disc in the turbocharger is seized up by constant heat and cannot rotate fully and causes the error condition in extreme cases. It is a quite common occurrence in Toyota 1KD-TV engines (P1251 error code). You will only find out when you buy up market power devices try to get some more power. Many people concerned about the over pressure problem when EGR pipe is fully blocked to stop EGR gas. Many worried what happens when you take your foot off the pedal and where those overcharged gasses will go? My answer is, it will dissipate through the turning cylinder. The cylinder is your turbo waste gate. Then they say wouldn’t it kill the engine with pre-detonation or stressing the engine parts? My answer is, how can a pure air can pre-detonate? When you take your foot off the pedal the fuel injection is stopped immediately and only pure air goes into the cylinder. And moreover, the pressure in the intake or cylinder is identical to the last burning pressure before you take your foot off the pedal. The air pressure is exactly same as the previous cycle when you were burning fuel. There is no special type of over air pressure condition is created. I must say they need to do some more study about diesel engine basics, in petrol engine yes, it can happen and you do need a waste gate to quickly relieve the pressure. When there is no fuel to burn in the cylinder, there is no danger whatsoever with only air. It will only do good thing like cooling the cylinder for the next combustion cycle for better efficiency. Remember, when you accelerate for full power the EGR system is shutoff by the car computer, the EGR pipe is blocked off by EGR valve and then the EGR valve is open again and remain open for emission control when the desired speed is achieved (decided by the car computer). The car computer also knows when and how much fuel will be injected. However, you will need to make sure the pressure difference between mass air flow (MAF) sensor and turbo boost (MAP) sensor must always be same compression constant ratio and must not deviate over 20% tolerance. Therefore, It is a very important that you should not create that condition in our Manual Mapper settings. For example, if you set the mapper dial at -10% for economy running and ATT (Artificial Turbo-boost Trim) setting is at +15%, then the total difference is now over 25% and this will cause the car computer to generate P0101 error code due to your setting is over 20% of tolerance (However, not always error code would come). P0101 error is the MAF sensor range and performance error. In this case, your setting should be dialled at -5% and ATT setting +14%, so it will be total 19% tolerance with some safe margins. If you wish to run at the super economy mode due to running out of fuel in the outback or whatever. Then you should turn off the ATT then set the mapper dial at -15%. This setting will give you dull pedal response, but the car computer will try to give you the maximum mileage. I have had few experiences in the highway running out of fuel between fuel stations, I have seen some 5.5L/100km in moderate camping gear payload with mapper dial setting -15%. I made to the fuel station. Who is doing this work? About Mr Young Jeon (Bsc, ND). Ozbush Electronics and its products are designed and manufactured by former car computer design engineer Young Jeon (retired) who spent entire his life in car and medical electronics. He has been working with car design people in US, Germany, Japan and Korea. 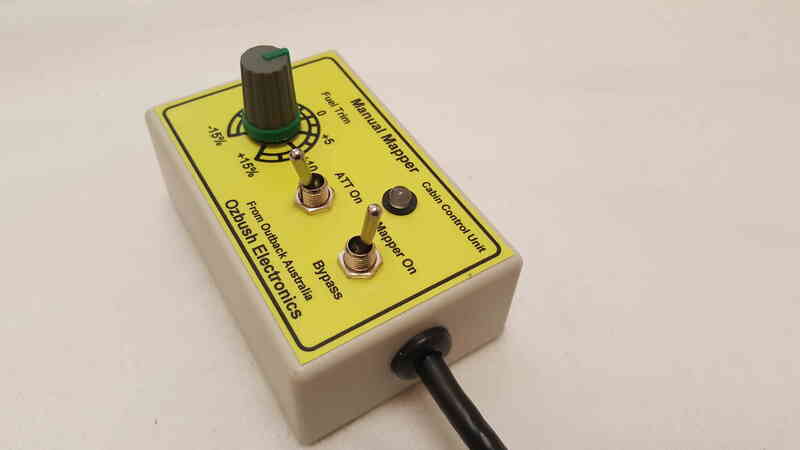 He also has many years of experience of developing military electronics equipment and this knowledge has been applied to our product here to make our product like military standard reliability. Mr Young Jeon has come back from his retirement to work and help our 4wd community. The reason for his come back was he loves 4 wheel driving all over Australia and found he could help many things in 4 wheel drive community, especially prolonging the life of diesel engines. He was appalled about flawed concept of emission control system such as EGR system which generates a very high amount of unhealthy carcinogenic substances just to reduce city smog (Nox gas) and also destroys engine far too early causing false environment savings. He said "When you buy new car and run for over 30,000km then test for Nox gas emission again, you will find none of the car will pass Nox gas emission test, you will need new engine. EGR system is flawed concept!" "There is better emission control system developed by VW which is Hydrogen Gas injection. This will get rid of just about all the harmful emission gases." "The EGR system is only for petrol engines because petrol is cleaner burn but should never be used in diesel engines, It has high compression and with EGR system it generates far too much harmful gas because EGR reduces combustion temperature which generates far too much unburnt gases." "Think deliverate indigestion caused by eating your own poo!" Thank you for your continuing support for 4wd community project.